If you're kids are getting a little big for the traditional child carrier's on the market, but you still love asking long hikes out in the woods, along the beach or sightseeing while on vacation, then My Freeloader Child Carrier may be just the solution you're looking for. Coming from someone that's always taken extremely long walks when something is on my mind, and raising two Boys on my own since they were very young, the My Freeloader Child Carrier could have come in handy multiple times. We had our routine down pact; the kids would walk on their own until the first one started getting tired. It was more of a game so neither wanted to give in first, and as a result sometimes we'd end up several miles away somewhere up in the Mountains usually resulting in a tie. This is where the piggy back rides start on our way back from whatever trail we were on at the time. It was a nice break for them as we made our way back to the vehicle, but not so much for Dear Ole Dad that never got a break most of the way. Who would've thought combining a traditional child carrier with a bicycle type seat would be the answer as the perfect way to give kids a piggy back ride? We'll Erick Jansen and Nathan Jones not only thought about a better child carrier for older kids, they perfected a brand new carrier that will forever change the Child Carrier Market. It's just one of those idea's you wonder why a product like this hasn't already been on the market for years. The two Dads took their (hopefully patented) brand new child carrier they named the "Freeloader" and started a Crowd Funding Campaign earlier this year. Erick and Nathan successfully raised the $30,000.00 goal needed to get the freeloader into production on March 29, 2013, with a little change to spare. Its clear quality and safety are the #1 concern for the product because it was made to carry their own kids in the first place. Being very clear about keeping all the manufacturing here in the USA where they could control the finished product, has led to a few setbacks getting the finished product into the hands of the Indiegogo backers. It's actually an interesting read going over the updates on Indiegogo and realizing no matter how good of a plan you may think you have, life first has to throw a few curve balls and see if you really do have what it takes to Succeed. Not only are Erick Jansen and Nathan Jones meeting these challenges head on, they have perfected a better product along the way. According to the website the Freeloader Child Carriers can only be preordered at this time with and expected delivery sometime this fall. 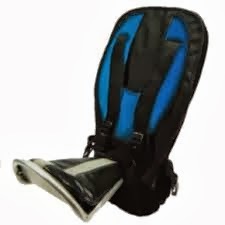 The dates line up that they could have used the sales numbers from the Indiegogo campaign during the Shark Tank interview, but will it be enough to entice the Sharks to invest in this new child carrier? Considering the stage Freeloader Business was at earlier this year if the Sharks do decide to make an offer, it most likely will be for a high percentage of the business. It's definitely a cool new product, but at a retail cost of $279.99, it's not affordable for a lot of family's which narrows down the market considerably. But never the less, there's thousands of parents that will gladly spend this much money to solve a very real problem especially if they spend a lot of time in the Great Outdoors. I'm a 53 y/o 260# grandmother with back problems. I carried my 3 y/o granddaughter on the red trail at Bushkill Falls on my shoulders!!! I would have LOVED to have had this then. I carried my grandson on my shoulders until he was 5, when my granddaughter was born! - I can't afford $279 but if I could buy one of these for under $100 - I'd not only buy it, but I'd use it!!!!!!! And the issue about the child unbuckling it??? Are you kidding? My grandkids are whining that they want to be carried!!! Yeah $279 is a little high. If they price was lower, I would so get one for my grand son. I am 55 yr old grandma who carries my granddaughter around when we go out . Would love one of these. But too expensive. Under $100..00. I would buy. One.